Editor at large & style consultant for Vogue Japan, Anna Dello Russo is collaborating with H&M for an over the top accessories line and I seriously couldn't be more excited. This fashion forward stylista is often photographed by The Sartorialist and is a permanent fixture at all the fabulous fashion events globally. The collaboration debuts October 4, 2012 just in time for Fashion Week. 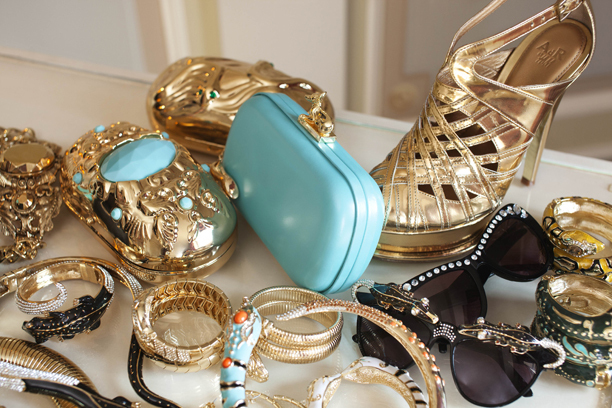 The collection will feature lots of unique items such as sunglasses, jewelry, bags, and shoes. The queen of ornamentation will no doubt cause a frenzy of woman trying to score these fabulously flamboyant designs (I will be one of them - already coveting all those box clutches)! Watch the video of the announcement & a peak into ADL's stylish world. Dressing up in all her baubles would be a little girl or a full grown adults dream come true!